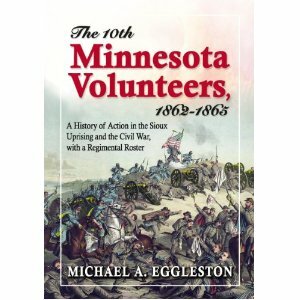 Eggleston: "THE TENTH MINNESOTA VOLUNTEERS, 1862-1865: A History of Action in the Sioux Uprising and the Civil War, with a Regimental Roster"
Members of what would become the 10th Minnesota Volunteer Infantry regiment fought in driblets during several of the early chaotic encounters of the 1862 Sioux Uprising in their home state. When fully organized under the command of Colonel James H. Baker, the regiment joined General Henry Hastings Sibley's brigade-sized expedition into Dakota Territory from June to September 1863. Finally sent across the Mississippi the following year, the 10th was attached to A.J. Smith's corps, fighting Confederates at Tupelo before being returned to the Trans-Mississippi to pursue the Price Expedition in Missouri. The unit closed out the war at Nashville (where it would suffer more casualties than all previous engagements combined) and Mobile. This geographically wide ranging service is explored in Michael A. Eggleston's The 10th Minnesota Volunteers, 1862-1865: A History of Action in the Sioux Uprising and the Civil War, with a Regimental Roster. Unfortunately, the regimental history section is a bit substandard. While eschewing the traditional narrative format for a more journal-like structure is completely fine, the execution, with its choppy writing, careless errors, and typographical mistakes, leaves much to be desired. Also, while Civil War Trans-Mississippi students and Indian Wars readers will welcome summaries of lesser known battles with the Sioux at places like Big Mound, Dead Buffalo Lake, Stony Lake, and Whitestone Hill, those expecting detailed descriptions of the specific battlefield roles assumed by the 10th Minnesota in the 1862-65 clashes with Indians and Confederates will be disappointed. Eggleston frequently employs block quotes from three of the Tenth's unpublished memoir (James Hart and Thomas Hunt) and diary (George Pettie) writers, but they are generally attached to the text without enough context to offer more than a vague understanding of the 10th's place in any given battle. Illustrations are plentiful and well selected (the battle drawings from Alonzo Connolly's A Thrilling Narrative of the Minnesota Massacre and Sioux War of 1862-63 are noteworthy). The maps, however, do not stray below the theater level. The appendices contain more documents (like Baker's published reminiscence) and information for those with a particular interest in the Sioux Uprising and Dakota War. The regimental roster, as well as the extensive casualty register that follows it, will be very useful for researchers. While the book misses the mark on much of what constitutes a good modern regimental study, it does at least tread upon military historical ground scarcely addressed by Civil War unit histories*, and it deserves repeating that the roster and casualty compilations are valuable contributions. * - see also Kurt Bergemann's Brackett's Battalion: Minnesota Cavalry in the Civil War and Dakota War. 1. The Chattanooga Campaign ed. by Steven E. Woodworth and Charles D. Grear (SIUP, 2012). The third volume in SIUP's Civil War Campaigns in the Heartland series. 2. One Drop in a Sea of Blue: The Liberators of the Ninth Minnesota by John B. Lundstrom (Minn Hist Society Pr, 2012). A thick regimental history, this book details the 9th's military service in Missouri, Mississippi (where they played a key role at Brice's Crossroads), Tennessee (Nashville), and Alabama (Mobile). Many of its members also languished in Andersonville prison. The 'liberators' moniker stems from a Missouri event involving 38 soldiers who blocked the attempted recovery of a family of fugitive slaves. The owner being a loyal Unionist, the men were arrested and held on mutiny charges. Story here. Sounds tedious (and made to order for talented interns), but necessary if you want your POD titles to be taken seriously. 1. War on the Waters: The Union and Confederate Navies, 1861-1865 by James M. McPherson (UNC Pr, 2012). I received and read an ARC of this one a couple months ago and immediately forgot about it until Dimitri wrote a bemused note about its arrival on his doorstep. Periodic works of synthesis like this one [and for the naval war these are not rare], are really only useful to me if they incorporate the best of recent scholarship, hopefully with proper placement of credit where credit's due. For instance, Earl Hess's recent military history of the Civil War in the western theater addressed current trends in occupation and guerrilla warfare scholarship. I never experienced the same feeling while reading McPherson's naval narrative. That's not to say it's a terrible book [unless this is a trend within its pages], it just doesn't offer anything to the non-novice. 2. Lincoln's Hundred Days: The Emancipation Proclamation and the War for the Union by Louis P. Masur (Belknap Pr - Harvard, 2012). Promoted as "the first book to tell the full story of the critical period between September 22, 1862, when Lincoln issued his preliminary Proclamation, and January 1, 1863, when he signed the final, significantly altered, decree". Asbury: "KIRKSVILLE: The True Story of Urban Warfare in America's Heartland"
The expulsion of regular Confederate forces from Missouri by the early months of 1862 left thousands of willing bodies trapped behind enemy lines. To tap this resource, uniformed and commissioned Confederate recruiting officers were sent to points all across the state that year, with high hopes of returning to Arkansas at the head of large hosts. One of these officers was Colonel Joseph C. Porter, who would operate in his native NE Missouri. His efforts resulted in great success, amassing over 2,000 men in a short period of time. However, the most pressing problem was getting such an unwieldy mass of often unarmed recruits across the Missouri River, which, along with the state's Union controlled railroads, comprised a powerful barrier to such movements. While Porter was able to buy time with several successful ambushes of his federal pursuers, he could not cross the river, and, forced back north, his little army was crushed at Kirksville, the only set-piece battle of his mini-campaign. Thwarted again, the force was largely disbanded. In the literature, the events of the great 1862 Missouri recruiting drive are summarized in excellent fashion in Michael Banasik's Embattled Arkansas (1996). Participant Joseph A. Mudd more specifically explores Porter's role in it in his memoir With Porter in North Missouri: A Chapter in the History of the War Between the States (1909). However, none of these publications describe the Battle of Kirksville at a level of detail approaching that of D. Craig Asbury's newly released Kirksville: The True Story of Urban Warfare in America's Heartland. In Kirksville, Asbury is able to describe in minute fashion, the preparations of both the Union and Confederate commanders and the conduct of the battle itself. Opposed by key subordinates Cyrus Franklin and Frisby McCullough, who wanted to post their men together in rough terrain west of town, Porter selected an urban battlescape, his men scattered in fields and buildings in and around town in hope of replicating the success of his earlier ambush tactics. As a compromise, Franklin and McCullogh's men would be posted behind a fence bordering the western edge of town. The reactions of Kirksville civilians to the approaching battle also form a significant part of Asbury's narrative. In his step-by-step analysis and description of the course of the fighting, the author hones in on the keys to Union victory. The success of Porter's plan of drawing McNeil's command into a deadly crossfire in the streets of Kirksville hinged on fire discipline, a difficult task even for experienced volunteers. To their commander's dismay, the men fired on a small scouting force, exposing Porter's carefully masked positions and ruining any chance of surprise. On the other side, Colonel John McNeil's mounted force of mostly Missouri State Militia (augmented by regular Missouri and Iowa cavalry detachments) was able to exploit advantages in artillery (Porter had none), small arms, and training to defeat a superior force in detail. Kirksville also follows the action beyond the titular clash. Though Porter suffered heavy losses at Kirksville, he was able to cross the Chariton River to temporary safety. On the run west of the river, he was nevertheless able to set up ambushes at Painter's Creek and Seeford. Even so, converging federal commands gradually forced Porter to break up and scatter his command. Asbury additionally addresses at some length the controversial events surrounding the killing of prisoners, including the shooting of Frisby McCullough and the mass execution of Kirksville prisoners by McNeil's men for parole violations. An aspect of the book's presentation that becomes immediately apparent to many readers is the lack of scholarly trappings. There are no notes, bibliography, or index. Keeping tabs on this project from afar, I know Asbury's performed a great deal of research on the subject, which makes it a shame the decision was made to leave the narrative undocumented. The sheer number of military and civilian perspectives discovered for this highly obscure battle indicate an intensive source material search was performed. The more casual reader doesn't care about this, but others, especially those interested in delving into their own research, would love to know the identity and location of these sources. Source notes would also have lended more authority to the areas where Asbury's research and writing overturn conventional historical wisdom (such as it is). A prime example is the modern plaque for Painter's Creek that presents it as an essentially bloodless fight. Like many self-published works of local history, the text also badly needs the services of a professional proofreader. To conclude with a return to the more positive aspects of Kirksville, the maps, especially the smaller scale ones, are excellent and plentiful. The sequence of drawings depicting each stage of the Kirksville fight convey all the tactical movements and terrain information today's readers come to expect from battle histories. Unsurprisingly, the positions of the Union units are known with more precision. Overall, I commend Craig Asbury for tackling this subject, giving Civil War Missouri readers by far the best account of the Battle of Kirksville. The book's flaws can in no way be dismissed (and I sincerely wish they can be addressed in a future edition), but, even so, I recommend the book to anyone interested in this nearly forgotten Missouri campaign and battle. 1. Holding the Line: The Battle of Allegheny Mountain and Confederate Defense of the Staunton-Parkersburg Turnpike, 1861-62 by Joe Geiger (WV Book Co., 2012). Anyone interested in the 1861-62 campaigns in western Virginia will want to pick up a copy of this book. 2. The Grand Design: Strategy and the U.S. Civil War by Donald Stoker (Oxford Univ Pr, 2012 - pb). As a collection (meager in size as it is), books analyzing Civil War strategy, operations, and tactics are an unsatisfying lot. Stoker's book, reviewed here, approaches the type of meaty treatment that military history specialists crave. It is newly out in paperback. Over on a certain e-retailer, I've been noticing a veritable flood of paperback reprints of old public domain Civil War unit histories, memoirs, and diaries self-published through a popular POD outfit. Apparently, they are being put together by this guy, who styles his effort Old South Books. I wonder how profitable a venture this is, as I am guessing, given that he's put out 350+ titles since May, that all or nearly all of these titles are available as free .pdf files on various sites. Sheppard: "BY THE NOBLE DARING OF HER SONS: The Florida Brigade of the Army of Tennessee"
When Civil War readers think of hard-hitting Confederate regiments and brigades, those from the state of Florida seldom come to mind. East and west, their contributions have been overshadowed by an unjust reputation for unreliability in battle. 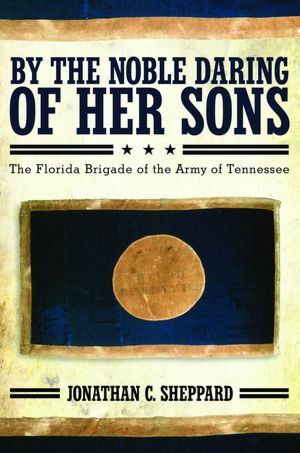 Thankfully, this view has been successfully challenged in recent years* Now, Jonathan Sheppard's By the Noble Daring of Her Sons finally gives the western theater "Florida Brigade" a full and evenhanded treatment that should serve well the historical memory of its men. The western theater Florida regiments would not serve in the same brigade under newly promoted Brigadier General Jesse Johnson Finley until November 1863, so the early sections of the book track individual regiments. Prior to the creation of Finley's command (excepting brief periods spent inside their home state), the 1st, 3rd, and 4th infantry regiments served in the Army of Tennessee, while the 6th and 7th infantries and 1st Florida Cavalry (dismounted) found themselves stationed in East Tennessee. Sheppard does a fine job of presenting the organizational histories of these units (which are also charted nicely in an appendix), while also giving readers a taste of the leadership infighting so common to Civil War volunteer formations. Floridians were present at most of the theater's important campaigns and battles, including Pensacola, Shiloh, Perryville, Murfreesboro, Chickamauga, Chattanooga, Atlanta, Franklin, Nashville, and Bentonville, and their roles on those terrible fields of conflict are duly noted in By the Noble Daring of Her Sons. Sheppard's summaries of Florida's participation in these battles offer the degree of detail appropriate to good brigade scale unit studies. However, unlike many other Civil War histories of this type, Sheppard's is not given to exaggerating the prowess of the brigade. Its analyses of Florida's good (e.g. 2nd Jackson), bad (e.g. Nashville), and mixed success (e.g. Chickamauga) days on the western battlefields are always judicious. Given the paucity of existing regimental histories [I only counted one -- for the 1st Florida Cavalry -- in the bibliography], the author's diligent attention paid to individual regiments prior to the November 1863 reorganization goes some way in making up for the deficiencies of the literature in this regard. The most noticeable weakness of these sections is with the maps. They are too few, and would have benefited the reader more if drawn at a smaller scale. In addition to his treatment of the brigade's military affairs, Sheppard also offers insights into the background of the men (most of whom had close familial ties to nearby Georgia and South Carolina) and the overall political and social milieu that spawned them. In terms of age of enlistment and range of motivations, the author found similar patterns to those found in works by Noe, McPherson, and Glatthar, but the percentage of Florida Brigade soldiers owning slaves was lower than the average figure for Lee's Army of Northern Virginia. Throughout the book, Sheppard puts his manuscript research to good use, conveying the opinions and experiences of the brigade's officers and men in their own voices. After so many decades of neglect, it is remarkable that fine unit histories for both major Florida Brigades have been published by the same press within a span of only two years. Compact without sacrificing coverage with depth, By the Noble Daring of Her Sons is highly recommended reading for those desiring to learn more about the contributions of the "Flowers" to the Confederate war effort in the West. * - see my review of Zack Waters and James Edmonds' A Small but Spartan Band: The Florida Brigade in Lee's Army of Northern Virginia (Univ of Ala, 2010). Students of the early war in West(ern) Virginia have a number of fine studies to choose from, but, until now, no one has tackled the Battle of Allegheny Mountain in book length format. Joe Geiger's Holding the Line: The Battle of Allegheny Mountain and Confederate Defense of the Staunton-Parkersburg Turnpike, 1861-62 (West Virginia Book Co., 2012) addresses this fight and more. "This book seeks to provide a detailed look at military activities along the Staunton-Parkersburg Turnpike from mid-September 1861 to the first week of April 1862. This campaign, fought primarily in Pocahontas County, Virginia, included the Battle of Greenbrier River, in which nearly 7,000 soldiers clashed in what was primarily an artillery duel; the Battle of Allegheny Mountain, the bloodiest battle of the first year of the war in present-day West Virginia; the January 1862 raid on Huntersville; and numerous other skirmishes, raids, expeditions, incidents and events". Geiger, who also wrote Civil War in Cabell County, West Virginia, 1861-1865 (Pictorial Histories, 1991), is the director of Archives and History at the West Virginia Division of Culture. 1. Robert E. Lee At War: The Mind and Method of a Great American Soldier, Volume One: Tragic Secessionist by Scott Bowden (Military History Press, 2012). This is the first of an 8-volume(!) military biography of Lee. The publisher has more information here. They also have a sample chapter. MHP pulled out all the stops on materials and presentation (it even has a ribbon marker). I am not familiar with Bowden's existing Lee scholarship, not having read his earlier Gettysburg book Last Chance for Victory. 2. So You Think You Know Antietam? The Stories Behind America's Bloodiest Day by James and Suzanne Gindlesperger (John F. Blair, Pub., 2012). The Antietam companion to the pair's So You Think You Know Gettysburg? Intended primarily for a "casual" audience, the guidebook offers Antietam trivia and stories, and features the battlefield's 96 monuments. It has 300 color photos, as well as maps and GPS data for visitors. 3. Thomas J. Wood: A Biography of the Union General in the Civil War by Dan Lee (McFarland, 2012). According to the back cover, this is the first biography of Wood, the Union general best known for the creation of the catastrophic gap in the federal lines through which the Confederates poured on the second day of Chickamauga. 1. A Carnival of Destruction: Sherman's Invasion of South Carolina by Tom Elmore (Joggling Board Press, 2012). This is a big, thick campaign history that looks nice, except for one big problem ... no maps beyond a single end paper theater map borrowed from the atlas to the O.R. 2. 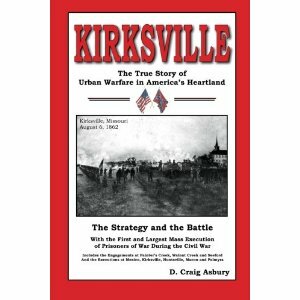 Kirksville: The True Story of Urban Warfare in America's Heartland by D. Craig Asbury (Kirksville Battle Publishing, 2012). The August 6, 1862 Battle of Kirksville smashed the NE Missouri recruitment campaign of Confederate Col. Joseph Porter. The victor, Union Col. John McNeil, became infamous then, and later at Palmyra, for his prisoner executions. This is the first book length history of the fight, and the engagements at Painter's Creek, Walnut Creek, and Seeford are also covered. The overall presentation is appealing, with an informative series of battle maps. I've been following the progress of this one a bit from afar, and know that Asbury's done a great deal of research, so I won't give it the blanket death slam for no notes and bibliography (hey, it's the Battle of freaking Kirksville, man, these don't pop up every day). Trans-Mississippians love to complain about what's ignored in the literature, but, given its small size, there's actually a rather large body of published material for the 1861-62 Confederate invasion of Arizona and New Mexico. Few have contributed as much to the field as historian Jerry Thompson. Westward the Texans: The Civil War Journal of Private William Randolph Howell (Texas Western Press, 1990) comprises yet another very worthwhile offering from this prolific Civil War author and editor. Thompson begins the book with a set of annotated bibliographical essays for the campaign (one each for diaries, letters, memoirs, official records, and newspapers), weighing the content and relative value of each. These are a great beginning resource for those looking to delve into primary sources. A soldier in the 4th Texas Mounted Volunteers, Howell began his journal in April 1861 and ended it in July 1862. Different from other existing diaries and letters, which are frequently fragmentary, Howell covers the entire Sibley campaign, often on a daily basis. Entries are typically only a few sentences, but early passages and those covering the fighting can be several paragraphs in length. The retreat chronicle is quite valuable, and remarkable given how arduous and worrisome the experience must have been and how sick Howell was near the end [As an aside, the book includes the best map that I've ever seen depicting the path of the retreat in the mountains west of Fort Craig]. As with most Thompson books, the background material contained in the notes is expansive, with mounds of detail associated with persons, places, and events mentioned in Howell's journal. The bibliography is richer than those found in most original works of the period, another common characteristic of Thompson's editorial career. With the diary and rich supplemental material, there's much in Westward the Texans to recommend to students of both the New Mexico Campaign and Texas Confederates in general. Though out of print, used copies are available at reasonable prices. 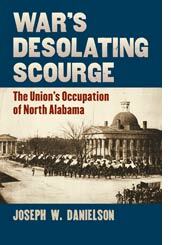 Danielson: "WAR'S DESOLATING SCOURGE: The Union's Occupation of North Alabama"
As with that of Civil War East Tennessee, most of the scholarship dealing with the home front in North Alabama centers on the region's Unionist population, the best single work being Margaret Storey's Loyalty and Loss: Alabama's Unionists in the Civil War and Reconstruction (LSU, 2004). In 2006, George Dahlen and Richard Bradley's From Conciliation to Conquest (U of Ala) examined occupation policies and practices in North Alabama in several fascinating contexts, keying in on the person and the actions of John Basil Turchin of "Sack of Athens" infamy. Covering the entire war beginning with the first federal advance into the region, Joseph Danielson's War's Desolating Scourge takes a more expansive look at the Union army's invasion and occupation of North Alabama. Union initiatives having the goal of bringing the Confederate civilian population to heel comprise the primary focus of the book, but the changing circumstances of the most immediate beneficiaries of the presence of federal troops, the slave population, is also scrutinized in some detail. As mentioned above, War's Desolating Scourge covers the entire war, but the lion's share of the text is devoted to the first Union command to enter the region, Ormsby Mitchel's division of Don Carlos Buell's Army of the Ohio, which set the tone for the rest of the conflict. Totally unsympathetic to the dictates of limited war advocate Buell, Mitchel and Turchin (one of Mitchel's brigade commanders) were hard war practitioners. In contravention of Buell's orders, but with the support of Washington, Mitchel set up his own punitive military, social, and economic policies for dealing with Confederate civilians. Danielson credits their material and psychological effectiveness with the gradual wearing down of Confederate morale and support for the war. With the menfolk in the army, women were often at the forefront of home front resistance. In his examination of this aspect of the war, Danielson makes excellent use of first person accounts written by Confederate women, some of whom remained defiant until the end while others were either worn down or resigned to a practical accommodation with the enemy. The full range of active and passive reactions to the punitive measures of Union forces is presented. It remains a fundamental truth that wherever the Union army marched, even within loyal slaveholding states, slavery was started on the path to extinction. This was certainly the case in North Alabama, a region with a large slave population. In addition to describing the army's role in emancipation, Danielson also focuses on black agency, whereby many slaves, even if they stayed on rather than fled, were able to take advantage of the absence of white male members of the household to negotiate or force favorable adjustments in the master-slave relationship. The primary weakness of Danielson's analysis is its uncritical acceptance of the traditional narrative that a conciliation policy was implemented until the middle of 1862, when, due to continued civilian refusal to submit to federal authority, harsher measures were required and implemented. Beyond being a too simplistic cause-effect analysis, it ignores recent scholarship documenting the application of hard war from the very beginning in large areas of the western and Trans-Mississippi theaters1. That evidence exists documenting the success of the more conciliatory approach in specific locales (e.g. Nashville under Buell) is not considered. One might also rethink whether conciliation overall was ever really given a chance before being pronounced a failure. In North Alabama's case, Union forces did not even enter Tennessee in full force until February 1862 (Fort Donelson surrendering on the 16th of that month). Mitchel's division marched through southern Tennessee essentially unopposed before entering North Alabama in early April. At no time during this fast moving 6-8 week period were Union forces not on active campaign as opposed to occupation duty, and conciliation was already being proclaimed a failure! Obviously, forces beyond stubborn Confederate civilian resistance were hard at work advancing punitive action as the favored mode of warfare. On the other hand, Confederate civilians practicing bushwhacking can unquestionably be held directly responsible for harsh retribution. Unfortunately, Danielson deals with this important facet of the war in North Alabama only in passing2. Though Bradley and Dahlen's more narrowly focused regional study does offer superior analysis of some issues common to both works (while also rightly questioning whether mass volunteer armies were even capable of conciliation3), Danielson's book is the broader of the two. His work contributes much in the way of documenting white female resistance to Union military rule, as well as social change and the gradual destruction of slavery in North Alabama. Though flawed in some important ways, War's Desolating Scourge fulfills to a significant degree the need for a Confederate home front study within a regional scholarly literature more often concerned with the Unionist population. 1 - This is an important theme developed in recent books by Daniel Sutherland [A Savage Conflict (UNC, 2009)] and Clay Mountcastle [Punitive War (Kansas, 2009)]. 2 - Danielson joins Sutherland and Mountcastle in the belief that bushwhacking and other forms of active irregular resistance did much to spark retribution, but the concept is not accepted by all historians. Earl Hess completely opposes this thesis in his recent book The Civil War in the West (UNC, 2012). While Hess has sifted through as much western theater manuscript material as any historian, I do find the work of Sutherland and Mountcastle more persuasive on this point. Nevertheless, the controversy over the issue is a healthy one that deserves more investigation. 3 - For a contrary view, see Mark Grimsley's profoundly influential The Hard Hand of War. Grimsley credits the average Union Civil War volunteer with an innate sense of limited war, a real desire to fairly discriminate between pro-Union and Confederate civilians. Which way the body of evidence leans is an arguable point comprising an interesting debate that even today, decades after the release of Grimsley's book, doesn't get enough attention. Back in June, I interviewed Earl Hess about his upcoming Knoxville book. The current issue of Civil War Book Review has another one discussing his western theater study published earlier this year, as well as a review [my review of the same book can be found here].